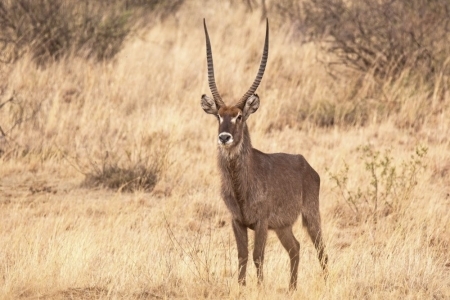 The waterbuck (Kobus ellipsiprymnus) is a large antelope found widely in sub-Saharan Africa. It is placed in the genus Kobus of the family Bovidae. It was first described by Irish naturalist William Ogilby in 1833. The thirteen subspecies are grouped under two varieties: the common or ellipsen waterbuck and the defassa waterbuck. The head-and-body length is typically between 177–235 cm (70–93 in) and the average height is between 120 and 136 cm (47 and 54 in). A sexually dimorphic antelope, males are taller as well as heavier than females. Males reach approximately 127 cm (50 in) at the shoulder, while females reach 119 cm (47 in). Males typically weigh 198–262 kg (437–578 lb) and females 161–214 kg (355–472 lb). The coat colour varies from brown to grey. The long, spiral horns, present only on males, curve backward, then forward and are 55–99 cm (22–39 in) long.